Make extra everything! Faith and the gang have ideas for reinventing Thanksgiving leftovers. 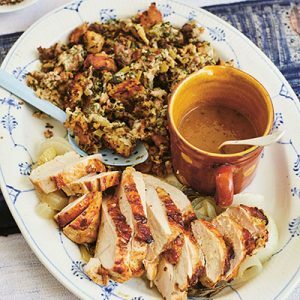 Julia Turshen joins the party with recipes from her book, Now & Again, including roast turkey breast and a sheet-pan stuffing. Plus, learn how to make perfect mashed potatoes and get Faith’s picks for holiday wines you’ll want to put out on the table. Mix and match. . .something for everyone! Our recommendation for this Thanksgiving: Shooting Star, a bold, opulent American red Zinfandel.